Born in Katona, Hungary in 1900, Barcsay was a descendant of an aristocratic family from Transylvania. In 1919, he went to Budapest where he began his studies in the Art School and graduated in 1924. The summer of 1926 was spent in Makó and Hódmezővásárhely, where he worked on the constructive structural powers in landscapes. In 1926, he went to Paris for a year where he discovered the works of Cézanne. Cézanne's paintings greatly influenced the young artist. While in Italy in 1927, Barcsay learned about the Quattrocento movement of the early Renaissance, particularly the anatomical studies of the period. 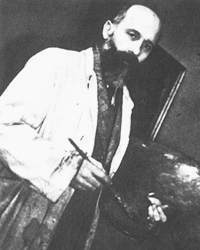 He became a resident of Szentendre after many visits and embarked on another fellowship to Paris in 1929 to understand the rules of cubism Born in Katona, Hungary in 1900, Barcsay was a descendant of an aristocratic family from Transylvania. In 1919, he went to Budapest where he began his studies in the Art School and graduated in 1924. The summer of 1926 was spent in Makó and Hódmezővásárhely, where he worked on the constructive structural powers in landscapes. In 1926, he went to Paris for a year where he discovered the works of Cézanne. Cézanne's paintings greatly influenced the young artist.